We have said it before, but many people do not realise that Market Lavington has a Manor House. It was built, somewhat extravagantly, in the mid-19th century to suit the whims and fancies of Edward Pleydell Bouverie. Some commentators are sure there was a big masonic influence in its design features. It still stands and still looks very grand. 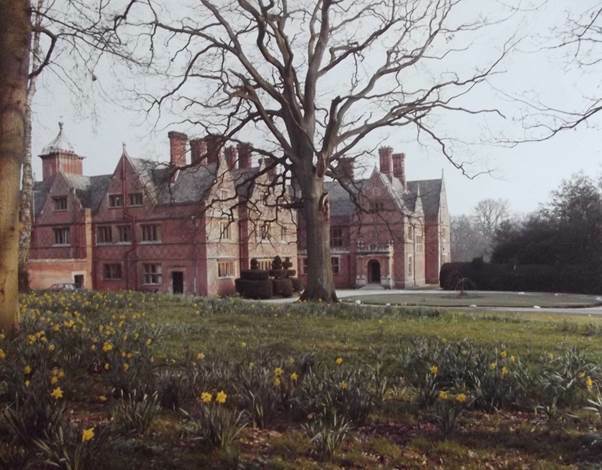 As we head for the season of snow, let’s look ahead to spring and see what the Manor House looked like in daffodil season in the 1980s – thirty years ago. It really is a handsome structure – particularly for those folks who love brick. The bricks were local, from the Market Lavington Brick Works and various patterns and motifs are picked out in darker coloured bricks. So how can people not realise this huge house exists? Well they probably know of its presence, but don’t realise that it was once the Manor House for our parish. After the death of Edward Pleydell Bouverie the house had a somewhat chequered career. During World War 1 it came under military or government control and got really run down. In 1926 Dauntsey’s School were able to buy the building and nearly 90 years on they still own it. People refer to the building as ‘Dauntsey Manor’ and as that school is based in West Lavington they may well think that the Manor is in that parish. In fact it remains a part of Market Lavington parish. We probably need to thank Dauntsey’s School for the fact that the building exists and is still in good order. It is hard to imagine any individual wanting to live there these days. This entry was posted on December 9, 2013 at 6:54 am and is filed under Museum. You can follow any responses to this entry through the RSS 2.0 feed. You can leave a response, or trackback from your own site.